Vanguard S&P 500 ETF (VOO) is one of the popular exchange traded funds. This index fund uses its assets to purchase large-capitalization stocks. This equity fund is tracking the performance of the S&P 500 index. The fund objective is to provide long term goals for capital growth. Note: The S&P 500 Index is representing 500 of the largest U.S. companies. This U.S. stock fund has a low expense fee of 0.05% per year. It has $31 billion of assets. The 52 week range of share price is $166.11 - $194.65. The current dividend yield is 1.81%. This large blend ETF has current share price of $192.52. 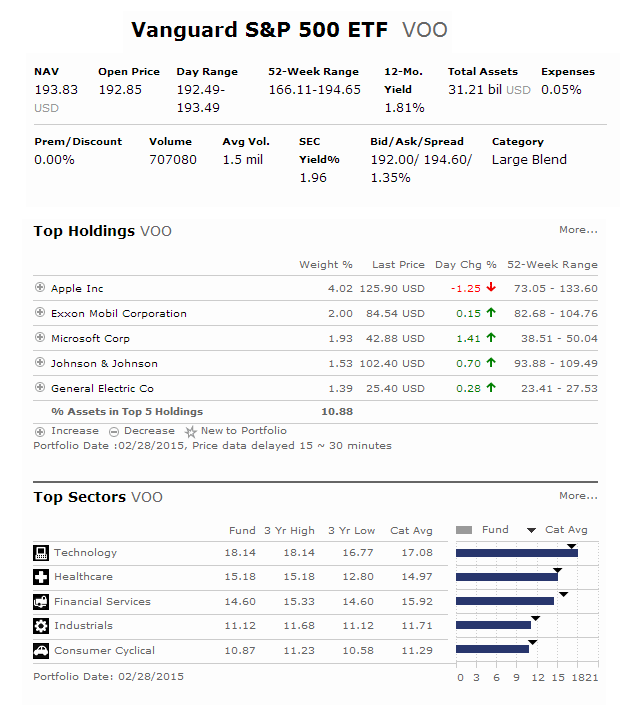 The top 5 stocks in its holdings are Apple Inc (AAPL), Exxon Mobil Corporation (XOM), Microsoft Corp (MSFT), Johnson & Johnson (JNJ), and General Electric Co (GE). Top 3 sectors are technology, healthcare, and financial services. This Vanguard S&P 500 ETF has low portfolio turnover rate. The expense fee is quite low.